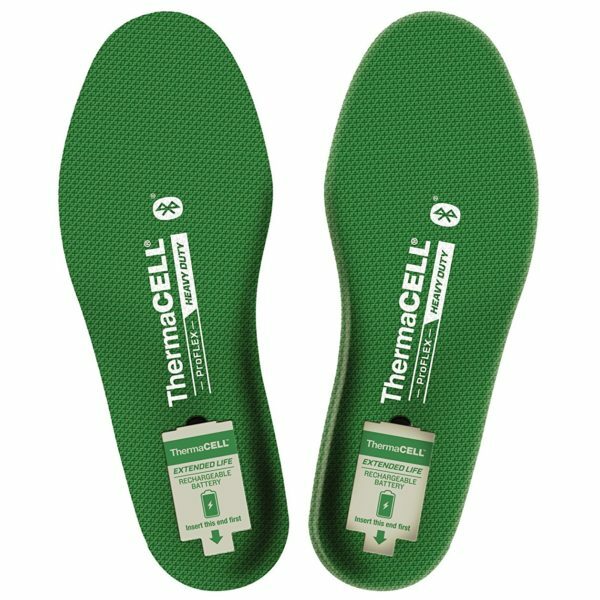 ThermaCELL Proflex are expensive but also one of the best heated shoe insoles you can buy. 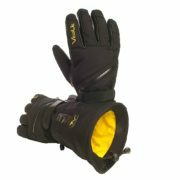 They provide over 6 hours of heating, with three temperature settings suitable for any cold weather. 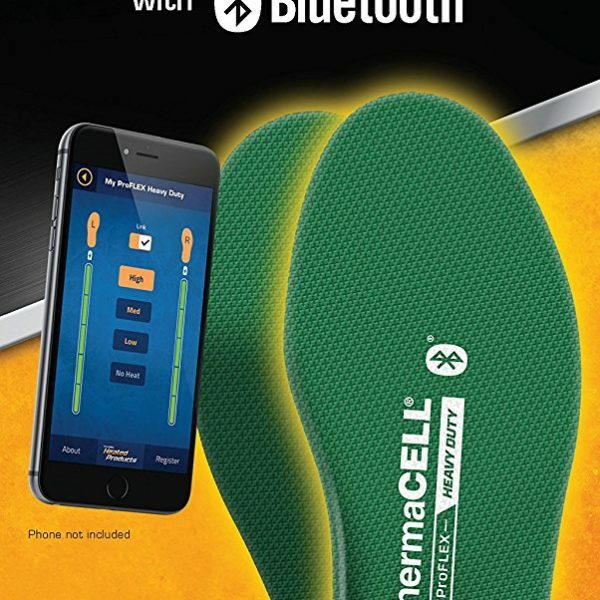 ThermaCELL Proflex insoles are Bluetooth-compatible and can be paired with any modern cell phone or tablet, allowing you to easily and conveniently control temperature as you please. 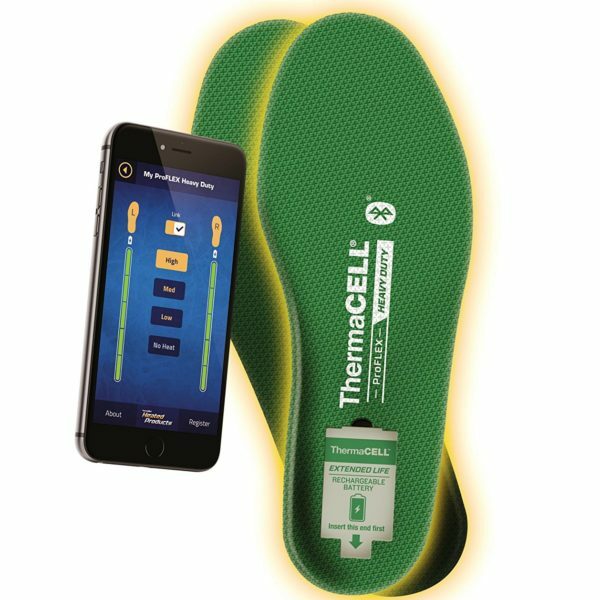 ThermaCELL Proflex heated shoe insoles are one of the best electric heated insoles on the market. 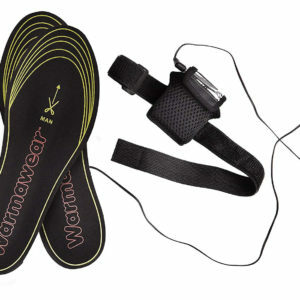 These heavy duty heated insoles are perfect for everyday use during any cold weather. 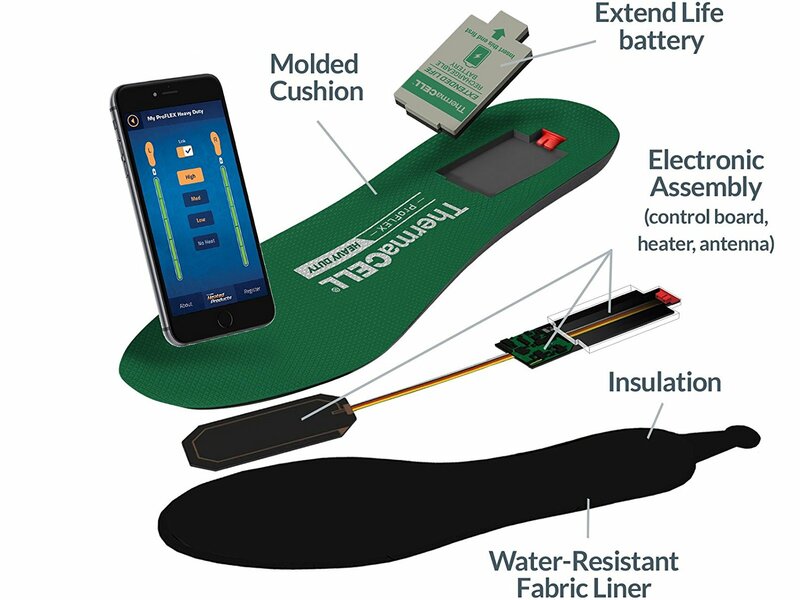 ThermaCELL’s heated shoe inserts are optimized for cushioning and stability. Padding on top of battery allows you to stay on your feet all day without any discomfort. Product is made of comfortable polyurethane and is highly water resistant. These electric shoe insoles come with two 3.7V rechargeable li-ion polymer batteries with 1300mAh capacity. 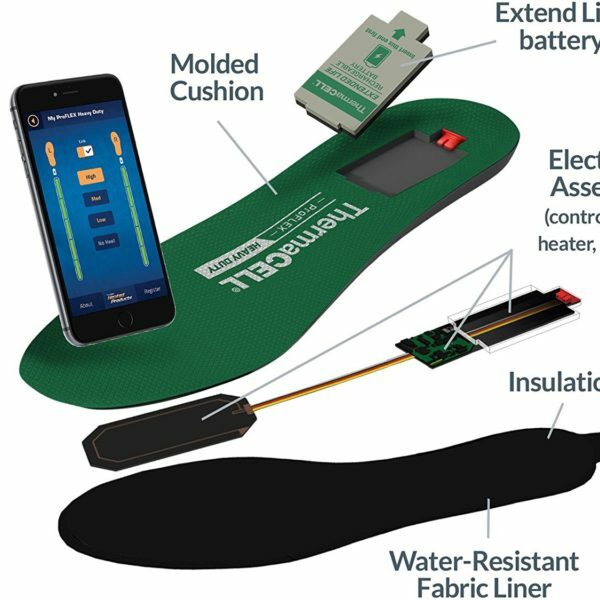 These batteries can provide up to 6.5 hours of continuous heat to your feet. 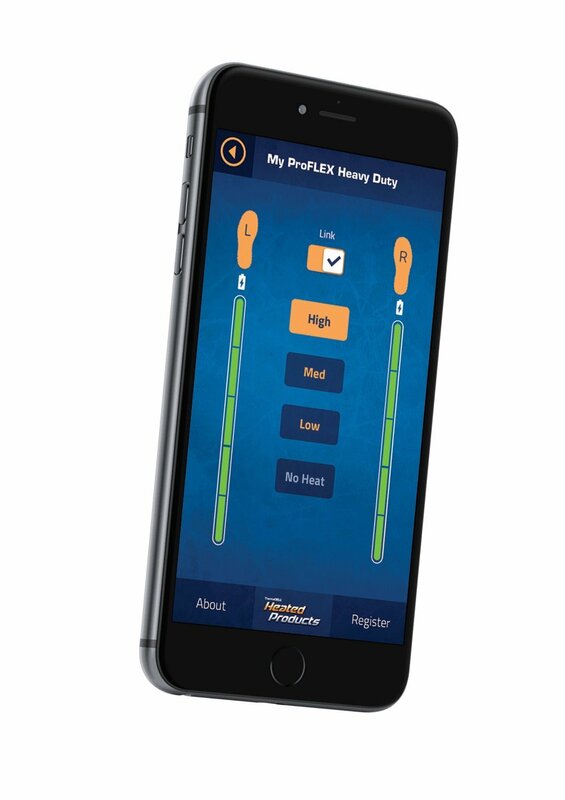 Proflex insoles have three heat levels: low (90°F), medium (100°F), and high (111°F). Temperature can be controlled wirelessly via Bluetooth. 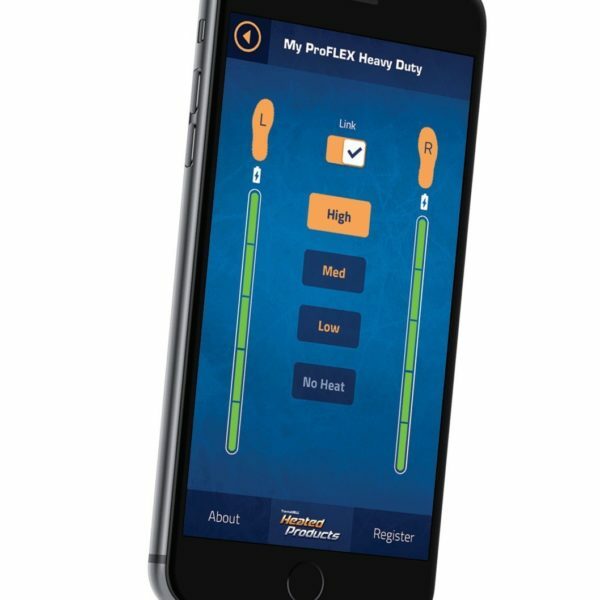 You simply connect/pair the insoles with any iOs or Android device and you can control the temperature with your phone or tablet. This is not only cool, but also very convenient. 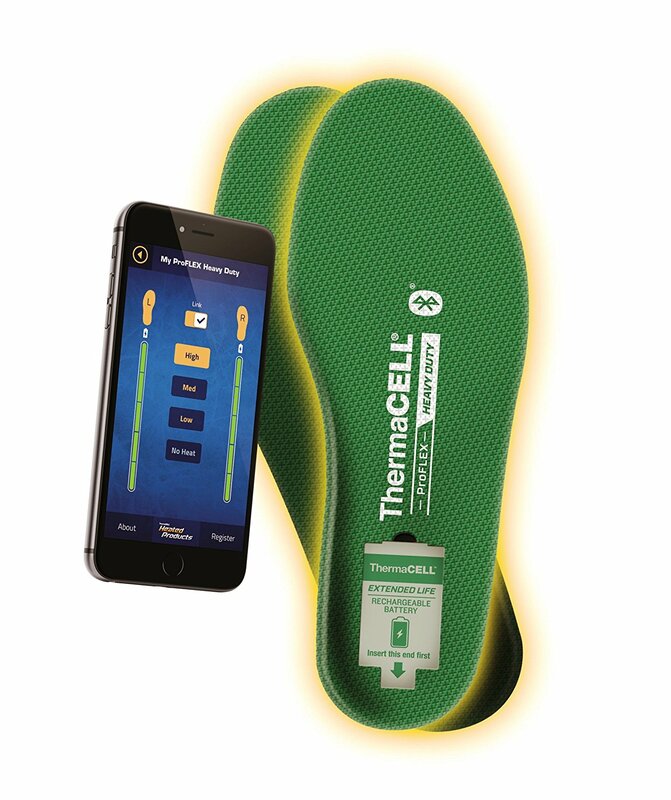 Smartphone app for ThermaCELL heated shoe insoles is compatible with most modern devices (iOS 9 / Android 5.01 or newer). It’s very easy to use and allows you to control the heat at any time based on your needs and preferences. 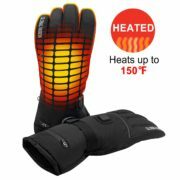 If you need over 6 hours of customizable heat this is the product to buy. 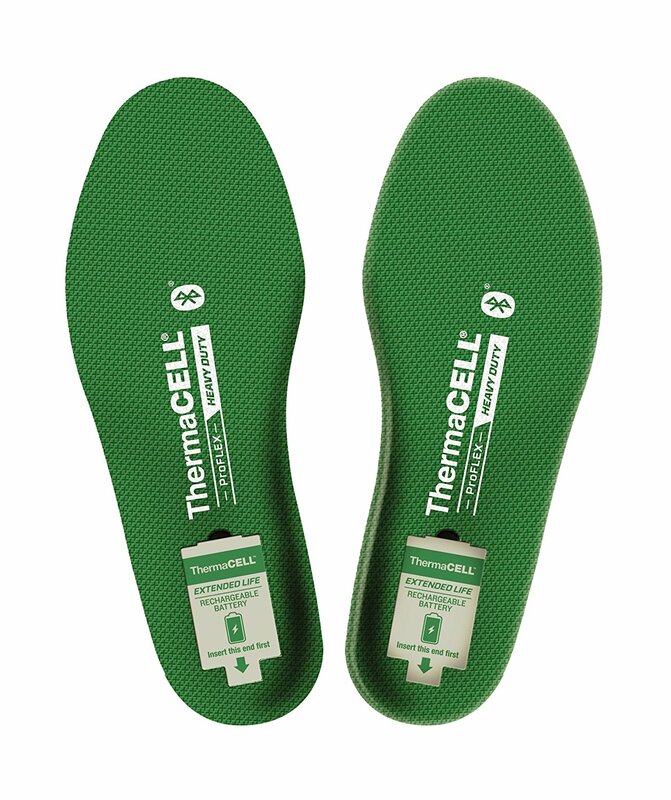 ThermaCELL Proflex are well-crafted and durable heated shoe insoles you should definitely consider. Having previously bought the original ThermaCell insoles and finding they only provided heat for a short time, I took a chance on these Heavy Duty ones. I use them for cold weather cycling, replacing my sole with these and covering the shoe with a polypropylene boot. I set them on high through the phone app and get a good 3 1/2 hours of constant heat at just the right level so my feet don’t sweat. Happy with this purchase! These are really nice and confortable, I set them on high for a few minutes to warm em up then drop down to the lowest setting.the charge is only down to maybe 40% after ~9 hrs. my feet get really cold in the winter especially sitting down with legs up. I have tried warmer slippers and wool socks but nothing works as well as these do. I would give them a 5 star but the setup on android was a bit difficult and I still have issues with battery level indication delay on one of the pads when I check it even though they are “linked” but it does indicate correctly if i recheck it. also the “location” on your devise must be turned on only when just starting the warmup process then you can turn it off and they control properly. Really nice and they work well. perhaps they will fix those bugs down the road. LOVE these. I haven’t had to move them off low yet. Fit perfectly in my boots. 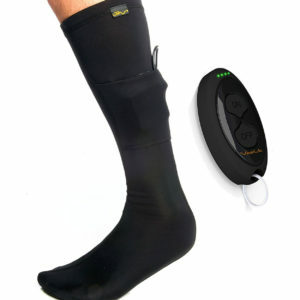 Wear with light wool socks and have had no issues with sweaty feet at all. Perfect for all day sits, but make sure your phone battery is charged! Unfortunately they are hit or miss, sometimes the connect fine to the bluetooth, other times not. Once connected they lose connection for no apparent reason and then cannot reconnect. used them for hunting and while they worked all was good. Not sure when they disconnected. Going skiing in a week and am afraid won’t either have them or have them working. Were a Christmas gift and hope I can return if I don’t get a reasonable resolution from Thermacell ( Thermacell wa very nice, answered on a Saturday and “escalated” my issue. Still, will take up to 2 4 – 48 business hours to respond. Awesome!! Very comfy. I have them in my hunting boots right now. I work outside and don’t trust them and my sweaty feet for a work boot. It’s just not a good idea… Plus the battery will get uncomfortable so I wouldn’t hike in them either. 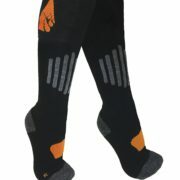 Overall a great product and I will use them to hunt or just to warm my achy feet after working in the cold all day. Wish they had more Battery life or atleast for the price included an extra set !!!! Very expensive utilitarian toy but not practical for hard labor (even when off) or hiking. Too much money not enough value. Don’t get me wrong. 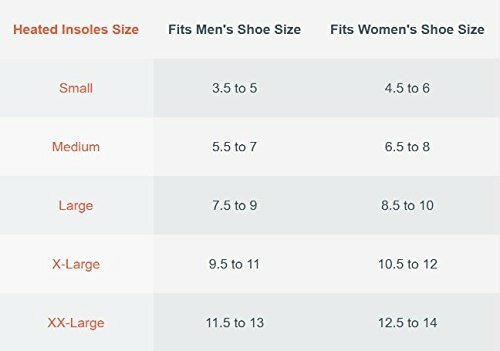 I like them just being realistic where I feel the ads lead ppl (my wife) on to believe these are super amazing work/hiking boot insoles. They are not. The insoles work well and there wa no problem setting up the Bluetooth controls. The left innersole seems to discharge the battery faster than the right. I have swapped batteries and it still is the same issue. Overall I am very happy with the quality and the have been keeping my feet warm, but the temperature has not gone bel9w 20 F, yet. These are awsome owned for a month now and love. Instant heat and perfect temp. Would have gave 5 stars if they were more comfortable. After a long stand or walk through the woods the heels start to hurt. Batteries are lasting about 5-6 hrs. Love the bluetooth. Awsome product! Blue tooth did not sync with the app. Contacted customer service via phone and they could not resolve the issue (was on their website end) and Thermacell never returned a call or email to fix it. Terrible customer service. The blue tooth app is a fantastic idea if it worked. We returned these and purchased Hotronics instead. I was going to put these in my ski boots, but they are much to wide (length was ok) and I don’t want to trim them and ruin them, so I will be sending them back. They work great for me. Use them tournament bass fishing in hunting boots, or in Bogs when it rains. Turned them on at 8 a.m. and they still hold a charge at 4:30 p.m. I do turn them off when the temperature gets warm enough to not need them. Always have charge left but I ensure I lower the temp as the day gets warmer. Have noticed one sole consistently has less charge remaining at the end of day; but usually one has half charge left and the other a third. So far they have worked perfectly and I have no issues. Also, they do not add any drain to the rate my phone battery goes down. Phone drains as it normally did without the Bluetooth link to ThermaCELL. I was excited about this product- but was highly disappointed in not only the amount of heat that was produced but also the length of time was less than advertised for the battery life. I would not recommend this product. These Thermacells are awesome. I just upgraded from the Gen 1 kind that you had to take the entire insole out to charge. These are so much easier. I see some on here that have had issues with connection. I thought i was having an issue too because only one of the insoles would show up when pairing but they both actually pair under the same number. Also, have real expectations about the warmth you are going to get from these. They are not made to roast your feet, just to keep them at body temp. But if you wait until your feet get cold it will feel like they are nice and toasty on high. One of the two insoles failed within 24 hours. Processing a replacement through ThermaCELL was a little slow, but they eventually sent me replacements. I have Raynaud’s, but keeping these on low while I am sitting in the tree stand is enough to keep feeling in my toes. When plowing snow in heavy wind (open tractor) I put them on high which is more than enough to overcome the wind blowing on wet boots and sitting on a metal tractor frame.